The project SUST-FOREST (multifunctionality, conservation and rural em-ployment in the territory of southern Europe through resin tapping) was funded by the Territorial Cooperation Program for the European Southeast Space 2007- 2013 SUDOE Interreg IV B of the European Un ion (project SOE2/P2/E261) and marked as targets to support and recover the extraction of the resin as a profitable forest use as contribution to rural employment, diversification of forest products, conservation and fire prevention the extense pine forests of the southern Europe. 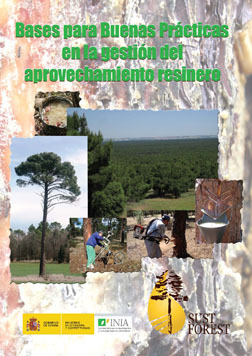 In its framework, this manual aims to be a tool for decision makers, enterprises, workers and other players of the resin sector that resume the most relevant environmental aspects of resin tapping and its interrelation with other forestry activities, multiple uses, and functions. It focuses on the geographical area of the central Duero river basin in inner Spain, a sandy plain where the resin yield is easily to rationalize due to its flat and accessible extensive pine forests. Physical Description : 96 p; 17x24; il. This book was added to our online catalog on Thursday 23 May, 2013.